#2015APPAM Conference • Alumni/New Student Happy Hour • D.C. Pardee RAND/RAA Talk • Holiday Party in Santa Monica • Wasserman Talks at Pardee RAND/RAA December Event • Holiday Lunch in D.C. This time of year reminds us to step back, look around us, and express our thanks and gratitude. It is no different at the Pardee RAND Graduate School, where we are reminded of the remarkable opportunity we have to work with our students and faculty and to be part of the broader Pardee RAND community comprising our RAND colleagues, the Board of Governors, Dean's Leadership Circle, and ... wait for it ... our alumni! This issue of Findings highlights the specific blessing we have in the school's history and legacy. We note with sadness the passing of RAND's second president, Henry S. "Harry" Rowen, who oversaw the founding of what was then the RAND Graduate Institute. He remained a strong supporter of the school and became a good friend. Harry is already missed. I’ll also draw your attention to what RAND President and CEO Michael Rich has declared "The Year of the Wolf"! Yes, this summer we celebrated Founding Dean Charles Wolf's 60th year at RAND. We've included a link to an essay collection recognizing Charles' many contributions to RAND, the school, and scholarship. Finally, I’m pleased to announce that long-time RAND advisor and supporter Harold Brown has doubled his original gift to the Be The Answer Campaign, establishing the Harold and Colene Brown Faculty Chair. You can learn more about this powerful program and our latest Brown Faculty Fellows below. 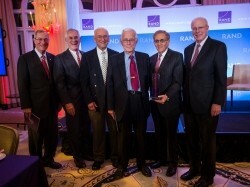 Three people—Harry, Charles, and Harold—each with more than a half century of leadership and involvement with RAND and instrumental in building the Pardee RAND Graduate School. Much to be thankful for. I’ll conclude by once again expressing my appreciation for each of you and your support to the school and our students. Enjoy the holidays! The Pardee RAND Commencement Ceremony will be held on the morning of Saturday, June 18, 2016; on Thursday, June 16, we're planning a welcoming mixer for alumni and students, and on Friday, June 17, we will host a dinner for alumni and graduating students. Stay tuned for more information about how you can be involved in planning and participating in this weekend which is becoming a tradition at the School. In 2014, we had over 50 alumni attend! How many will we see this year? You may recall from earlier issues of Findings (or Facebook or Twitter) that Pardee RAND professors Dave Baiocchi, Beau Kilmer, and Aimee Curtright each spent part of their summer as Harold and Colene Brown Faculty-in-Residence at Pardee RAND interacting with students on a topic or topics of their choice. The Browns' continued generosity and support has led them to endow a Faculty Chair, so we can offer many future faculty members the same opportunity. "Harold has been critical to the growth of our graduate school," said RAND President and CEO Michael Rich. 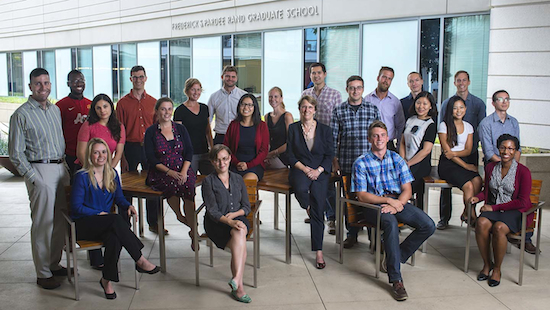 "This Chair will rotate between RAND researchers to allow them to be in residence at Pardee RAND, providing student mentorship while infusing innovative thinking that will inspire students to take on the most complex policy problems." In March 2015, Pardee RAND welcomed Kathryn Dunst as the second career services advisor for the School. Kathryn's career has spanned government, private industry and the not-for-profit sectors where she has gained in-depth expertise in talent management, recruitment and business development. This fall, building on the strong foundation laid by our first career services advisor, Ira Krinsky, Kathryn spearheaded efforts to offer a host of new professional development activities, including a three-part career skills workshop in defining yourself, accomplishments and differentiators, and the rollout of student-led Career Groups. Check out our comprehensive list of initial job placements, by year, for all 2010-2015 graduates. 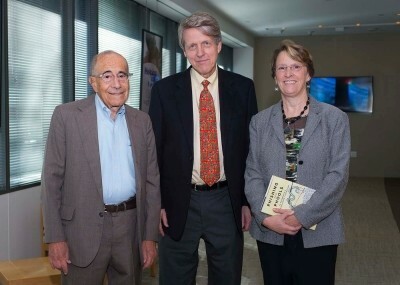 Pardee RAND hosted American Nobel laureate and economist Robert "Bob" Shiller as part of the Charles Wolf, Jr. Endowed Lecture Series. Shiller was awarded the 2013 Nobel Prize in Economic Sciences, together with Eugene Fama and Lars Peter Hansen of the University of Chicago, for their empirical analysis of asset prices. In a wide-ranging talk drawing on his just-published book, Phishing for Phools: The Economics of Manipulation and Deception, Shiller touched on topics from the current stock market and Federal Reserve decisions on interest rates to why we should be suspicious of aftershave and anyone trying to sell us something we don't need. The audience comprised approximately 60 students plus 60 faculty, staff and researchers. Students in attendance received autographed copies of Shiller's book. The Charles Wolf, Jr. Endowed Lecture Series was established by Pardee RAND alumni and other funders with the intent to honor Wolf, the school's founding dean and current faculty member, by bringing renowned economists and speakers to the school to address important and timely policy issues. In honor of Charles Wolf's 60 years (so far!) at RAND — including 27 years as founding dean of Pardee RAND — RAND published a compilation of tributes and reflections by his friends, colleagues, and students. Contributions from Pardee RAND alumni included Arthur Brooks (cohort '96), Eric Larson (cohort '89), Daochi Tong (cohort '94), and Hui Wang (cohort '88). Our new students — the 2015 cohort — arrived in September. The cohort includes 22 students from the United States, Canada, Mexico, Nigeria, South Korea, and Taiwan, as well as — for the first time — students from Finland, Guatemala, and Romania. 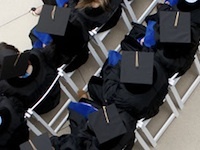 Eighty-seven percent of the students in Cohort '15 hold advanced degrees, including M.D., M.A., M.S., M.P.P., and M.P.H. Nearly all have career experience, including in international organizations such as the World Bank, UNICEF, and the Inter-American Development Bank; health organizations such as the Harvard School of Public Health and the Vanderbilt University Medical Center; and think tanks and university research organizations such as the University of Denver Pardee Center for International Futures. We also are proud to have current or retired military officers from the U.S. Air Force and Navy. Thanks to the continued generosity of our donors, for the third year in a row all students are receiving a full-tuition scholarship for their first year at the School. Learn more about this cohort and their many talents by browsing the Students page of our website. Pardee RAND students have been busy collaborating on RAND reports and journal articles, as well as many blog posts. Below is a sampling of recent releases; a full list of student-authored research is available online. 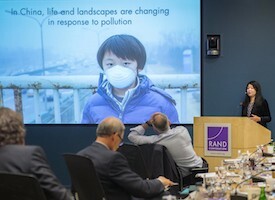 Student Min Mao (cohort '11) presented to the RAND Board of Trustees last month sharing the findings of her January report, Costs of Selected Policies to Address Air Pollution in China; more recently, she coauthored Quality of Life Indicators and Policy Strategies to Advance Sustainability in the Pearl River Delta. Students Amanda Edelman (cohort '13), and Ujwal Kharel (cohort '11), and Mollie Rudnick (cohort '11), with Prof. Matt Lewis, coauthored Results from the Teach For America 2015 National Principal Survey to help TFA staff provide more-tailored support to corps members, inform professional development, and continue to build relationships with the principals of schools in which corps members serve. A research trifecta including Pardee RAND students Edmundo Molina-Perez (cohort '11) and Abdul Ahad Tariq (cohort '10), alum/professor Jordan Fischbach (cohort '04), and Prof. Rob Lempert coauthored Managing Water Quality in the Face of Uncertainty: A Robust Decision Making Demonstration for EPA's National Water Program, which uses two case studies to demonstrate how Robust Decision Making (RDM) can help to address future uncertainty by identifying vulnerabilities in water quality plans and suggesting appropriate responses. Students Crystal Huang (cohort '13) and Nelly Mejia (cohort '11) worked with Prof. Peter Glick on The Private Sector and Youth Skills and Employment Programs in Low- and Middle-Income Countries, a report that examines the involvement of the private sector in youth skills and employment in low- and middle-income countries. Student Tim Smith (cohort '13) wrote a commentary in Newsweek on climate change issues in the Arctic. It's Getting Harder and Harder to Live on Top of the World was published as delegates arrived in Paris for COP21, the United Nations Conference on Climate Change. Henry S. "Harry" Rowen, who served as the second president of the RAND Corporation, oversaw the creation of its graduate school, and extended RAND's reach into domestic policy in the 1970s, died November 12 at age 90. Rowen commented in 1993, "RAND was already in the business of educating people through its research output. The idea was to make it more explicitly an educational institution. The graduate school was an experiment and a successful one." Jack Clift (cohort '06) is now a senior program officer at Results For Development Institute. Michael Egner (cohort '03) is now head of methodology at The NPD Group. Xiaoyan (Shawn) Li (cohort '04) is now director, Global Health Economics and Outcomes Research, at Bristol-Myers Squibb. Robert Reichardt (cohort '95) was elected to the Littleton, Colo., School Board in November. He is an education consultant based in Littleton. Michael Shires (cohort '90) was appointed to the Board of Trustees of the National Institute of Public Finance. He is an associate professor of public policy at Pepperdine University. Mark Schuster (cohort '91), the William Berenberg Professor of Pediatrics at Boston Children's Hospital, was the guest speaker at Harvard Medical School's second annual Diversity Dialogue lecture this fall. The title of his talk was "The Doctor Is Out: A conversation with Dr. Mark Schuster on being a gay physician at Harvard" and was featured on the Harvard Medical School website. While at RAND, Schuster was a principal member of the team that drafted the RAND report for the Clinton administration that showed that openly gay men and lesbians could be successfully integrated into the military. 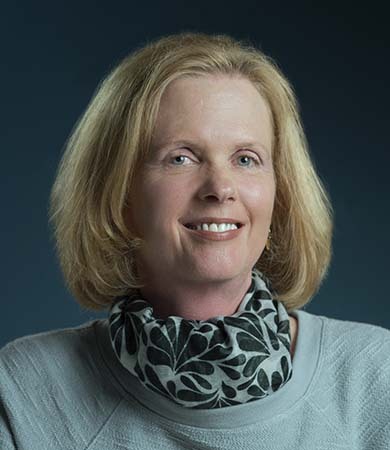 Janice Blanchard (cohort '98) coauthored a case study of Health First Florida, Improving Hospital Efficiency Through Data-Driven Management. Chaoling Feng (cohort '09) wrote a Brookings policy brief, Embracing interdependence: the dynamics of China and the Middle East, in which she argues that China and particularly the GCC states must work to further institutionalize their growing economic interdependence. Lindsay Daugherty (cohort '05) authored a RAND report, Competency-Based Education Programs in Texas: An Innovative Approach to Higher Education. Steven Isley (cohort '10) and three Pardee RAND professors authored The effect of near-term policy choices on long-term greenhouse gas transformation pathways in the journal Global Environmental Change. Bradley Stein (cohort '97) coauthored an article in the Milbank Quarterly, Where Is Buprenorphine Dispensed to Treat Opioid Use Disorders? The Role of Private Offices, Opioid Treatment Programs, and Substance Abuse Treatment Facilities in Urban and Rural Counties. Meena Fernandes (cohort '05) coauthored Why Schools should be on the Frontline in Combating Malnutrition for the FAO's Global Forum on Food Security and Nutrition. David Groves (cohort '01) wrote a RAND blog post, Ensuring Robust Water Management Strategies in Lima. Silvia Montoya (cohort '06) wrote a commentary for the World Economic Forum, Are poorer pupils doomed to fail? Athar Osama (cohort '99) coauthored a commentary, Institutions: Revive universities of the Muslim world, which was published in Nature. Jeffrey Wasserman (cohort '85) wrote a Newsweek commentary, Gun Violence: Where Is the Research that Might Save Lives? Shira Efron (cohort '11); dissertation: The Use of Unmanned Aerial Systems for Agriculture in Africa: Can it Fly? Sarah Evans (cohort '12); dissertation: Improving the Cost Efficiency and Readiness of MC-130 Aircrew Training. She is now an A9A analyses and assessments branch chief with the United States Air Force. Beth Katz (cohort '10); dissertation: District-Union Collaboration on Teacher Evaluation Reforms: Case Studies of Three School Districts in California. Jeremy Kurz (cohort '12); dissertation: Improving Utilization of and Adherence to Treatment for Post-Traumatic Stress Disorder among U.S. Servicemembers and Veterans. He is now a special tactics officer with the United States Air Force. Leslie Mullins (cohort '12); dissertation: Change Talk in a Group Motivational Interviewing Setting and Risk Reduction among Homeless Young Adults. 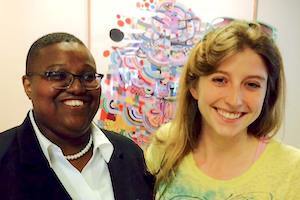 She is now a social science analyst with the U.S. Department of Housing and Urban Development. Jordan Rozsa (cohort '12); dissertation: Improving Standoff Bombing Capacity in the Face of 21st Century Anti-Access Area Denial Threats. He is now a pilot trainee with the United States Air Force. David Schill (cohort '06); dissertation: Improving Energy Security for Air Force Installations. He is now a program manager with the United States Air Force. We are also proud to announce our 350th graduate, Sarah Evans (pictured at right congratulating fellow alum Leslie Mullins on her dissertation defense). Last issue we inquired about interest in working with Robin Meili and her RAND International team as we globalize RAND's outreach. Their inboxes have been rather empty and we know they would really love to work with you. Critical policy challenges are both domestic and global, and the public interest has no borders. RAND's work around the globe has benefited over 50 countries in the past 5 years. We have worked on international governments' and NGOs' problems through every unit at RAND. If you are interested in being a part of connecting RAND to policymakers in your country or region, please send a note to prgs-alumni-news@rand.org. Once again we will be honoring an alum with the Alumni Leadership Award during our 2016 Commencement Weekend. This award is designed to recognize prominent alumni who show passion, leadership and discipline in their careers, and who have made exemplary and important contributions to public service. We will send an email in early January asking for formal nominations, so please start thinking about who should be considered for this honor. 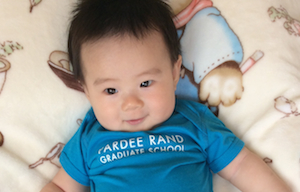 Future student Alan Gu, son of Kun Gu (cohort '11), shows off his Pardee RAND pride! 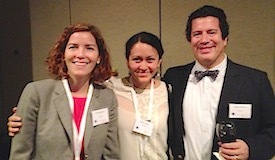 Pardee RAND again was well-represented by students, faculty, alumni and staff at the APPAM 2015 Fall Research Conference in Miami November 11-14. The annual Pardee RAND reception at APPAM for alumni, faculty, students and friends of RAND and Pardee RAND was a terrific evening and a fun opportunity for alumni to reconnect with faculty and one another and to meet current students. Many alumni, students, and faculty presented papers, posters and served on panels at the conference on topics ranging from "What Can Africa Learn from Leading Countries' Paths to Unmanned Aerial Vehicle Technology?" to "Predicting Healthcare Costs and Use in the United States under Single-payer Alternatives." Student presenters included Christina Huang (cohort '10), Ujwal Kharel (cohort '11), Sung-Bou Kim (cohort '09), Jody Liu (cohort '12), Nelly Mejia (cohort '11), Youngbok Ryu (cohort '11), Gaby Weinberger (cohort '13), and Cameron Wright (cohort '12). 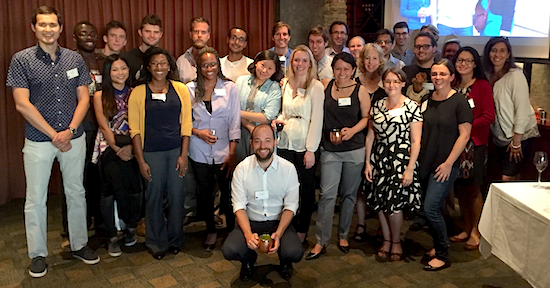 On September 18 in Santa Monica, alumni helped welcome the 2015 cohort at the Pardee RAND Alumni & 2015 Cohort Happy Hour. Several alumni joined us, including Ricardo Basurto-Davila (cohort '03), Adam Gailey (cohort '07), Cathy Krop (cohort '92), Richard Krop (cohort '92), and Amber Moreen (cohort '02). Dean Marquis was recently joined for dinner in New York by Michael Dardia (cohort '89); and in Boston by Abigail Brown (cohort '02), Katya Fonkych (cohort '00), Ying Liu (cohort '04), Mustafa Oguz (cohort '09), and Ethan Scherer (cohort '07). It was great seeing you — we'll try to get photos next time! Several Pardee RAND alumni were in attendance at the RAND and Pardee RAND Alumni Event, "Informing the Health Care Policy Debate," presented by Prof. Christine Eibner on September 16 in Washington, D.C. We enjoyed seeing David Apgar (cohort '80), Sharon Arnold (cohort '85), Diana Epstein (cohort '05), Chaoling Feng (cohort '09), John Nelson (cohort '71), Gary Parish (cohort '75), and Rachel Schmidt (cohort '88). A big thank you to alumni who helped recruit new students at our admissions information sessions around the country this fall: Jordan Fischbach (cohort ‘04) in Pittsburgh, Ryan Keefe (cohort '04) and Ethan Scherer (cohort '07) in Boston, Eric Jesse (cohort '08) at the U.S. Air Force Academy, and Diana Epstein (cohort '05) and Leslie Mullins (cohort '12) in Washington, D.C. Please join us for a holiday party with students, faculty, staff, and alumni at Pardee RAND from 4 p.m. to 6 p.m. Food, drinks, a live concert featuring Pardee RAND students and faculty, and lots of holiday cheer will be in abundance! RAND and Pardee RAND Alumni are invited to join Pardee RAND alum Jeffrey Wasserman (cohort '85) and RAND researcher Ian Coulter for a discussion on "The Future of Integrative Medicine." 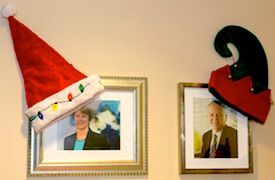 This will take place at RAND, with a reception at 5:30 p.m. followed by the program at 6:30 p.m.
December 21: Holiday Lunch with the Dean in Washington, D.C.
Dean Marquis will host a holiday lunch on Monday, December 21 at 12 p.m. We hope you will be able to join her!